Today is a special day. It is especially significant for my wife Mary and me since our oldest son, Jackson, graduates today. Though my receding hairline says otherwise, I am certainly not old enough to be the Dad of a high school graduate. There are many parents here today who share that same feeling. 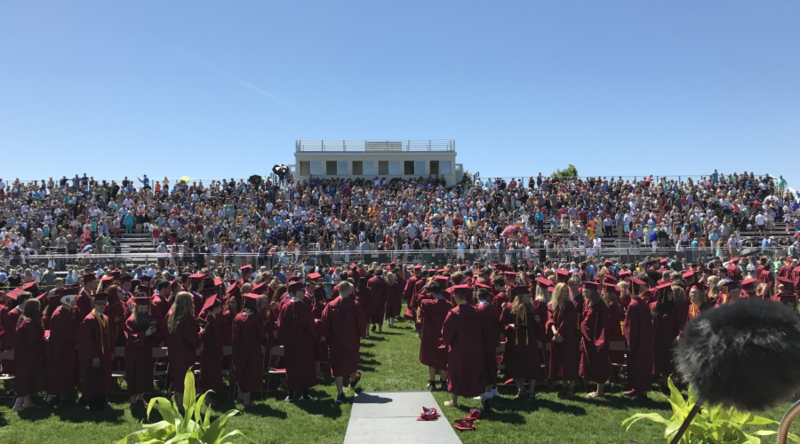 I am so proud of Northfield High School’s Class of 2017. You have excelled in the classroom. You have advocated for fairness, equality, and justice. You have brought us joy with your artistic prowess and elated us with your accomplishments in athletics. Most importantly, you have demonstrated great character and consistently positive leadership for Raider Nation. Thank you for your immeasurable contributions to our school and community. They will not be forgotten. Enjoy the present moment. Not just today, but every day. As many of the adults here, I have learned to savor the little things in life. Try, to the best of your ability, to recognize those special moments and lock them into your memory. Being present in the moment – and for the people you are sharing that moment with – is an incredible gift. r own mental well-being. You could be grateful for a neighbor, someone from your faith community, or any of the outstanding educators – teachers, coaches, or support staff – you have gotten to know in our schools. Here’s the tip of the day – give your parents a big bear hug today and thank them for their support. Today, we are most excited for your future – because it is our future too. We are excited to see how you will embrace it in your own individual way. There will be triumph, trials, and more mundane moments than many of us would like to admit. I encourage you to develop a positive future narrative for your life. Set goals. Review them. Be open to changing them as life unfolds. Finally, remember life will always about relationships. Strive to be a good listener. Seek opinions that differ from your own and work hard to understand them. Be kind and respectful. Consider how your actions impact others. Our society needs you more than ever. We need you to help us regain a collective sense of altruism – doing good things for others without expectation of anything in return. Because we can. It will bring what everyone wants most for you: happiness. Enjoy the moment, graduates — reflect on your past, actively plan your future, and be good to one another. Congratulations. Now, go make your corner of the world a better place.